The Road to Escondido was originally conceived as a project whereby Cale would produce an album of Slowhand's. However, it ended up being an ostensible collaboration between the two, the end result of which will benefit Cale more than Clapton. The prominence of the latter's name in the artist credits ensures a visibility for the album that it wouldn't have received had it been issued under Cale's name alone. And it's entirely appropriate that EC's name comes second, because this is essentially a J.J. Cale album with Clapton as sideman and co-producer. In those dual roles, however, the great English guitarist simply doesn't do proper justice to Cale's talents, such as they are. Clapton has long admired Cale and gained some of his greatest commercial success with songs of his, such as "After Midnight and "Cocaine. It is, then, perfectly understandable Clapton would want to work directly with Cale and emulate his approach. Yet Clapton's original tune, "Three Little Girls, might well be just an outtake from his last studio album Back Home. And while EC's cover of " Sporting Life Blues certainly rings true to his personal history, it's not a credible copy of Cale's style. The sly, low-key charms of Cale's songs are evident in "Last Will and Testament and "When This War is Over. But his blues-rooted understatment would definitely benefit from economy and brevity, neither of which really appear on "Danger, which, like too many cuts here, simply goes on too long. John Mayer's presence on "Hard to Thrill, his composing collaboration with Clapton, makes sense for marketing purposes, yet it's symbolic of the conflicting agendas in play here. A decidedly simpler approach to this recording, including the consistent presence of a small band like the one Clapton utilized on 461 Ocean Boulevard (Polydor, 1974), would've benefited everyone. Every bit the well-schooled, astute musician Mayer wants to be, Derek Trucks would flourish in such an environment for he has tremendous taste and restraint as a musician. Dividing his time between his own group and the Allman Brothers, the precocious young guitarist has been member of Clapton's tour band this year and first played with Slowhand on these November 2005 sessions; he is readily identifiable on "Missing Person," and "Who Am I Telling You?, but neither these, nor other arrangements allow for much extended improvisation during which Trucksand/or Clapton and Cale for that mattermight lend musicianly distinction to this disc. The instrumental passage on the last track, "Ride the River," seems merely an afterthought, leaving an impression of The Road to Escondido as a well- intentioned concept that simply wasn't properly executed. Visit J.J. Cale and Eric Clapton on the web. Track Listing: Danger; Heads in Georgia; Missing Person; When This War Is Over; Sporting Life Blues; Dead End Road; It's Easy; Hard To Thrill; Anyway The Wind Blows; Three Little Girls; Don't Cry Sister; Last Will and Testament; Who Am I Telling You? ; Ride The River. 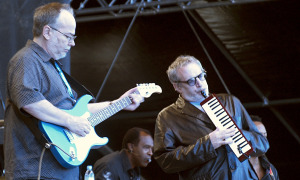 Personnel: J.J. Cale: vocals, guitars, keyboards; Eric Clapton: vocals and guitars; Jim Karstein, James Cruce, Steve Jordan, Abraham Laboriel Junior: drums; Gary Gilmore, Willie Weeks, Nathan East, Pino Palladino: bass; Billy Preston: Hammond organ, Wurlitzer piano, Rhodes; Walt Richmond: acoustic piano, Wurlitzer piano & Rhodes; Doyle Bramhall II, Derek Trucks, John Mayer, Albert Lee: guitars; Christine Lakeland: acoustic guitar, background vocals; David Teegarden, James Cruce, Jim Karstein: percussion; Taj Mahal: harmonica; Dennis Caplinger: fiddle; Bruce Fowler, Marty Grebb, Steve Madaio, Jerry Peterson: horns.